Our stock motor controller modification service enables us to quickly make changes to existing motor controllers – this saves time on design and testing time and can deliver a high quality solution in a matter of weeks. In this case study, the customer was initially going to use the ZDBL20DC brushless DC (BLDC) motor controller but a late change in their customer’s specification meant that that they needed to run at 12V whilst still retaining the same overall power. By returning to the original design files for the ZDBL20DC motor controller and quickly respec’ing components to meet this change in voltage and current we were able to quickly develop the right solution for the customer in an exceptional time frame. When we modify and existing motor controller design, we are starting from the base point of a proven design. Modifications to the power output stage as in this case (physical layout changes are another good example) can therefore be completed very quickly by increasing the current handling capacity of the board and changing key component specifications such as mosfets. 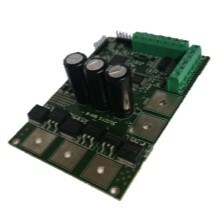 If you are looking for a specific motor controller then please do get in touch with us to discuss your requirements as we have an extensive database of designs, many of which are not part of the stock range but which can be adapted or modified to meet your requirements.